This 24 year old female was referred to an oral surgeon for evaluation of a swelling involving the inferior portion of the lingual cortex of the left mandible. 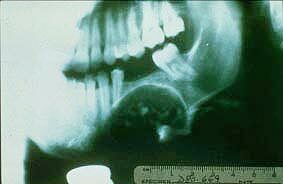 According to the patient, the second bicuspid and first molar teeth had never erupted. The radiograph shows a well demarcated radiolucent lesion containing scattered calcifications and an embedded tooth. There is also cortical expansion of the inferior border of the mandible. In areas, the lesion is bordered by a hyperostotic lining. 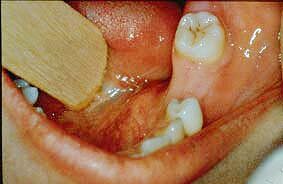 Calcifying tumors such as cementifying or ossifying fibromas usually do not contain embedded teeth. 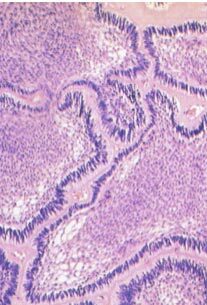 It is also too posterior for an adenomatoid odontogenic tumor and there is not enough calcified material for an odontoma. Slide 1 (medium power, H&E). There are sheets of polyhedral-shaped epithelial cells containing round to oval dark nuclei. These sheets of cells contain and are also separated by dense acellular amyloid-like material. 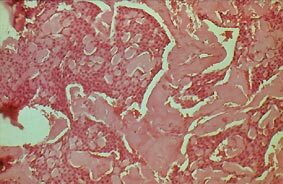 Scattered calcifications are noted in the upper left corner of the slide.